Our burger tasting at The Shack in Playa del Rey was in sharp contrast to our recent trip to The Counter. At The Counter, you go to be seen (and eat a hell of a hamburger). The Shack is a place to hide from the world. On this night we chose to hide among the arcade games in the way, way back. As was noted by several of our BurgerTourists, The Shack is a phenomenal dive bar with a good selection of beers and alcohol – but probably not a great place to impress a date. We at the BurgerTour had heard big things about their celebrated Shack Cheese Burger. 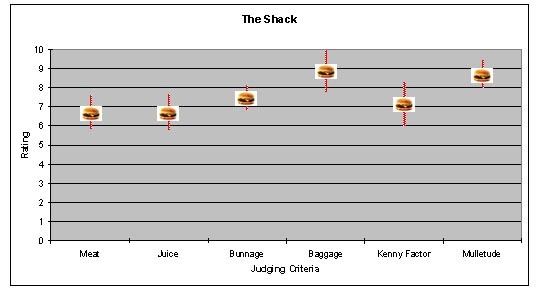 In the end we were divided on the quality of the Shack Cheese Burger. Several of us were blown away by our towers of meat. To quote the very quotable Whitney, "Pork sausage, beef, and bacon…it's like a barnyard in my mouth." On the BurgerTour, this is high praise. Others, specifically a finicky German girl, felt that “the sausage was just too overpowering” (she later admitted to being a poor excuse for a German). Ultimately we all agreed that the burger was more sausage than burger and that the burger itself was average to mediocre. I thought the sausage was wonderful, and this was proved out in the ridiculously high “Baggage” rating. The food ordering process at The Shack is simple – order at the cash register and they bring out the food. No fuss. I liked it. If you go online (http://www.delreymenus.com/theshack/coupons.htm) you can print out a coupon for a free order of fries or onion rings. This is highly recommended, especially for the rings.